It looks like Michele Obama is right on obesity. According to a new study released by the Institute of Medicine, or IOM, the fight against obesity can no longer be relegated to simply urging individuals to do better, but must become a nationwide battle. The first lady has come under repeated criticism from the right wing for trying to set up a “nanny state” because of her efforts at prevention of childhood obesity. Obama has taken the lead in the fight, publicizing it and setting up the Let’s Move foundation, which aims at tackling childhood obesity. “Solving this complex, stubborn problem requires a comprehensive set of solutions that work together to spur across-the-board societal change,” read the report, titled “Weight of the Nation” and released yesterday at the Centers for Disease Control and Prevention’s conference. This is not the case in most school districts. In New York City, for example, the Department of Education has a contract with Snapple, the company that produces highly-sugared “fruit” drinks, giving that company a monopoly on school vending machines. The report recommends, also, that students of all ages should “have opportunities to engage in at least 60 minutes of physical activity daily” through gym classes, as well as be taught basic nutrition. Schools across the country have cut gym classes in trying to grapple with local budget shortfalls. While promoting government and business policy changes, the IOM is seeking to take its case directly to the public. 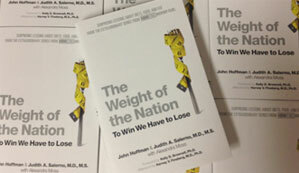 Along with HBO, the CDC, the National Institutes of Health, Kaiser Permanente and the Michael and Susan Dell Foundation, the organization began the “Weight of the Nation” initiative, which will include an HBO documentary series. For more information, the IOM is directing people to the Weight of the Nation website. A full list of recommendations can be found here. Photo via Institute of Medicine.